Why do they even publish these papers? The June issue of Obstetrics and Gynecology leads with a paper entitled Vaginal Birth After Cesarean: New Insights on Maternal and Neonatal Outcomes. VBAC is currently an extremely controversial topic within obstetrics. The issue is whether an attempted vaginal birth after Cesarean poses greater risk to mothers and babies that a planned repeat C-section. VBAC is known to increase the risk of rupture of the uterus, a catastrophic complication that can lead to death of the baby, massive maternal bleeding, hysterectomy and even maternal death. How would we study the relative safety of the two choices? We’d need to compare the mortality and morbidity of women who intended to have a vaginal birth after C-section with those women who intended to have a planned repeat C-section. In other words, the study groups should be based on intention to treat, not the eventual mode of delivery. This is an absolutely critical requirement. That’s because women who have a uterine rupture during attempted vaginal delivery after C-section are almost invariably delivered by C-section in order to save their babies’ lives and their lives. If the groups were based on ultimate mode of delivery, all the uterine ruptures and all the associated complications would end up in the C-section group, and not the attempted VBAC group. All studies on maternal and neonatal outcomes reported on actual route of delivery rather than intended route. In other words, the results of the study are USELESS for answering whether attempted VBAC or planned C-section is the safer mode of delivery. The study does NOT compare women who attempted a VBAC with women who chose planned C-section. It compares women who had a SUCCESSFUL VBAC with women who had chose a planned C-section PLUS women who had a C-section because they couldn’t deliver vaginally or because they had a serious complication like uterine rupture. The authors then proceed to detail their useless results. Not surprisingly, since the women who experienced complications during attempted VBAC were included in the C-section group instead of the VBAC group, the risk of maternal mortality was elevated in the C-section group. Both perinatal and neonatal death rates were increased in the VBAC group possibly reflecting the fact that C-section is generally safer for babies. In contrast, the studies that looked at uterine ruptures and classified patients according to intended mode of delivery demonstrated clear superiority of planned repeat C-section. Uterine rupture is a potentially life-threatening complication that has been directly attributed to VBAC. By itself, uterine rupture is a visible or palpable anatomic finding rather than a health outcome. However, its association with perinatal and maternal morbidity and mortality raises substantial concerns among patients, clinicians, hospitals, and policy makers… Four studies reported uterine rupture outcomes for both trial of labor and elective repeat cesarean delivery. Among these four studies totaling 47,202 patients, there were 154 uterine ruptures; 96% (n=148) of which were incurred by the trial of labor group… The risk of uterine rupture in the trial of labor and elective repeat cesarean delivery group was 0.47% (95% CI 0.28–0.77%), and 0.026% (95% CI 0.009–0.082%), respectively, with trial of labor group having a significantly higher risk of uterine rupture (RR 20.74, 95% CI 9.77–44.02, P<.001). One of the major findings of this report is that the best evidence suggests that VBAC is a reasonable and safe choice for the majority of women with a prior cesarean. 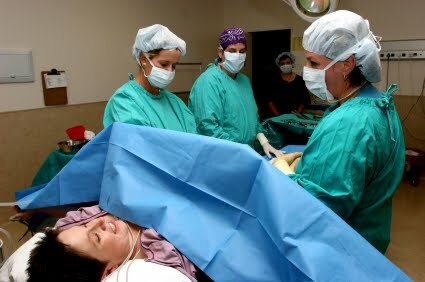 Importantly, studies of VBAC compared with elective repeat cesarean delivery have traditionally reported outcomes based on actual route of delivery rather than intended route, leading to misclassification of patients who intend elective repeat cesarean delivery but go into labor before their cesarean or women who intended trial of labor but who are delivered by cesarean. Not only is this an important point, it is a critical point because it means that the studies cannot tell us how attempting a VBAC compares with a planned repeat C-section, the one thing that we most wish to know. So this study, designed to determine the safety of VBAC when compared to planned repeat C-section tells us nothing about the safety of VBAC when compared to planned repeat C-section. And on a more general note, much as I appreciate a blog that makes a counter-point to some of the insane poppycock spun by high school dropout midwives, getting on a high horse about these issues is not helpful to anyone. The care provider’s job is to present the pros and cons of a particular procedure to a patient; it is THE PATIENT’S job to choose which risks she is or is not willing to assume. This is marginally insightful but intent doesn’t tell us what’s safer. If a woman had a TOLAC and ended with a C-section without complications, how is this a counter-indication to a TOLAC if most TOLACs end with perfectly safe vaginal deliveries?? It’s NOT. As far as study design, however, the comparison groups should be these: TOLAC ending in safe birth, TOLAC ending in emergency C and safe birth, TOLAC ending in vaginal delivery and complications, TOLAC ending in emergency C and complications, planned C with complications and successful planned C.